Residing in Bakersville, North Carolina, John Britt provides ceramic enthusiasts with an optical feast through the lively and lovely oil spot glaze surfaces of his functional porcelain wares. 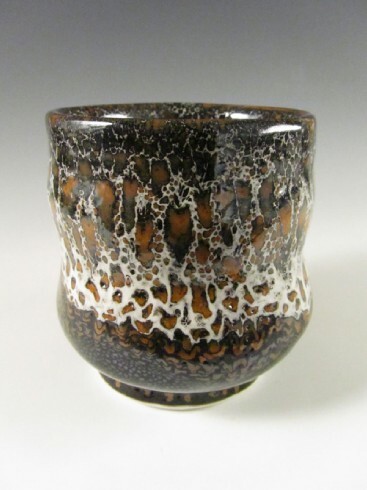 Interestingly, for this year’s Winter Show, Britt bestowed Green Hill Center for NC Art with a fascinating selection of “leopard” spotted porcelain cups and bowls. To form these surfaces, Britt layered a light-colored glaze over his oil spot glaze. The technology behind Britt’s delicately dappled finish lies in the alchemic discovery of the release of oxygen atoms from red iron oxide during oxidation firings of 2250°F. The oxygen atoms pull small amounts of iron oxide to the surface of the glaze forming bubbles, or “oil spots.” The oil spots arrive at their varying forms by way of Britt’s timing adjustments during firing almost as if Britt were a gardener making fruitful adjustments to his bed of crops. Britt’s selection of “leopard” spotted cups and bowls are also visually reminiscent of iced winter landscapes infused with moonlight, earth, and campfire. The surfaces demonstrate a dynamic harmony of the glazes’ elemental qualities while becoming a sea of movement for the mind’s delight. Through his works for Winter Show, John Britt offers us an endless opportunity to celebrate the season of winter through a cup for tea or coffee or a bowl for soup or stew. He generously presents us with a joyous journey for our palates through the graceful forms of his oil spot glazes and porcelain compositions. Green Hill Center for NC Art celebrates North Carolina Artists with its annual Winter Show. The exhibition runs December 2 through January 13th. Works are available for purchase. For more information, contact Michelle.Lanteri@greenhillcenter.org. Britt, John. The Complete Guide to High-Fire Glazes: Glazing and Firing at Cone 10.